Jalopnik Book Preview: Roland Barthes's "Mythologies"
Back before Ruthless Reviews imploded and became the derivative mess it is today, we were pretty funny. The site was so freewheeling that we were going to start reviewing films we hadn't watched. We never did, but we should have. Now I'm advocating a book I haven't read, yet. I promise you that I will. Why? Well aside from being a Red at heart, who can resist a chapter about "The Sexual Politics of the Domestic?" Certainly not moi. Why do I mention Barthes's book on the fanboy site that exists in the form of jalopnik.com? Cause our favorite French post-structuralist (or is that semiotician?) tosses in a section about "Technocratic Icons of Modernization." Which is Ivory Tower shorthand for our favorite topic: cars. 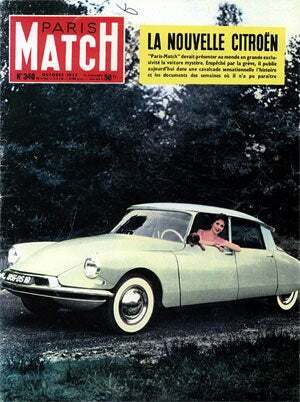 Specifically, one of our favorite cars, the Citroen DS. Jump for a little bit more. "In postwar France the car became the very symbol of modernity. This is reflected in a number of films of the period such as Lola (1960), La Belle Americaine (1961) and, more catastrophically, Jean-Luc Godard's Weekend (1967). The automobile industry was central to France's increasing industrialization with Renault's vast modern factory at Billancourt as its most visible reminder. This factory, incidentally, provided the setting for Claire Etcherelli's Elise ou la vraie vie (1967). In La nouvelle Citroen (Barthes: 1970 p.150-2) Barthes understands this perfectly and analyses the ways in which the car has become the very icon of France's modernization. He compares the car to a mediaeval cathedral: both are works produced by anonymous artists which enchant the masses." "More than this, however, advertizing [sic] is responsible for promoting the 'myth' of free choice. In Saponides et detergents (Barthes: 1970 pp.38-40) he discusses the different advertising approaches to Omo and Persil. Their advertising promotes two different products with two different properties. In reality, these two products are almost the same and are both manufactured by the Anglo-Dutch multinational Unilver." Dy-na-MITE! Er, Dyna Z! Part of the Panhard Dynasty!